The pink, white and green tricolour flag, or PWG, can be seen all around Newfoundland and Labrador. There is a deluge of clothing and accessories emblazoned with the flag, usually accompanied by the slogan "Republic of Newfoundland." It has been asserted in the media and on the internet that it has represented the island for some 200 years. Yet Newfoundland was never a republic, and the PWG was never an official or republican flag. That it represents independence to some today is a product of the province's troubled post-Confederation history. As with many traditions and symbols that appear to be ancient, the PWG is not. Rather it is a late 19th century product which took the place of an earlier tricolour flag that has been forgotten. Although the pink, white and green tricolour, or PWG, can be seen all around the province, it was never an official flag of Newfoundland and Labrador. As with many popular symbols of uncertain origin, the story of the PWG has a mythic quality. 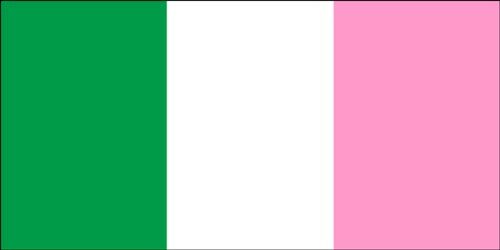 One tradition claims that Roman Catholic Bishop Michael Fleming created a pink, white and green flag in the 1840s to make peace either between foreign and native-born Catholics, or between Catholics and Protestants, depending on different versions of the story. The colours are said to represent the green of Ireland, the pink of England's rose, and the white of the Scottish thistle. In the early 20th century the myth expanded to include the Newfoundland Natives' Society (NNS), a non-denominational organization founded in 1840 to promote the advancement of the native-born. According to this version, despite clinging to their own flag for years, said to be a green fir tree on a pink background, the founders eventually accepted the popular Fleming-created flag. Thus was born the claim that the PWG was the flag of the NNS, which has often been taken as fact. There is no evidence to support any of these stories. Extensive work on both Bishop Fleming and the NNS shows no indication of the existence of a pink, white and green flag in the 1840s. Moreover, Fleming was viciously opposed to the Natives' Society and it is highly unlikely it would have accepted anything designed by him. In addition, there is no evidence that the NNS used a fir tree flag. It may possibly have existed at some earlier unknown date, and is claimed to be of New England origin. Rev. 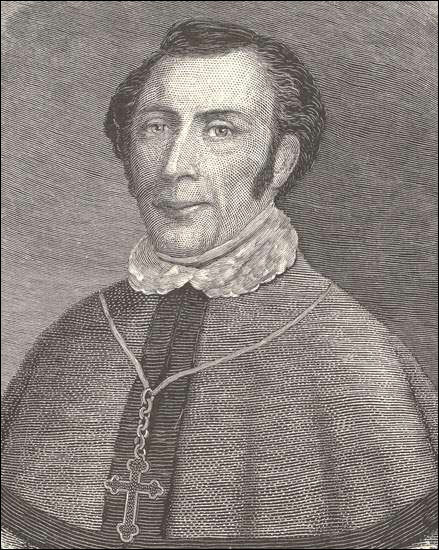 Michael Anthony Fleming (1792-1850), n.d.
No evidence supports the legend that Roman Catholic Bishop Michael Fleming created the pink, white and green tricolour in the 1840s. Artist unknown. From M.F. Howley, Ecclesiastical History of Newfoundland (Boston: Doyle and Whittle, 1888) 1. What the Natives' Society did use is clearly documented. Its official silk flag had a red background featuring an elaborate shield depicting aspects of Newfoundland life. There were clasped hands above the shield, and below it the motto "Union and Philanthropy." This red silk flag was simplified at some time before 1852 into a red, white and green tricolour, these being the colours of the Society's accoutrements. These flags and colours were displayed at various Native events in the 1840s-50s, and were adopted by branches of the Society outside St. John's. The NNS itself lasted until an unknown date in the mid-1860s. The issue of colour must be addressed. It has been claimed on PWG fan websites that "red" and "pink" were synonymous in the 19th century. The Oxford English Dictionary, however, identifies them as separate colours, with "pink" differentiated as far back as 1669. In addition, newspapers of the time clearly distinguish between "red" and "pink" in their reports of public activities, including specific references to the Native and other flags. Even the supposed pink flag with a fir tree is suspect, if it ever existed, since the New England original which Newfoundlanders are said to have copied had a red background. It was this tricolour, the Native red, white and green flag, which many people accepted as the first flag of Newfoundland. Representing the land and its people, it was often used at social and political events. For example, in 1852 pro-responsible government candidates in St. John's, led by the future Premier Philip Little, flew it at their rallies. It also was flown at the consecration of the Roman Catholic cathedral in 1855, by Anti-Confederates in the famous 1869 election as the flag of Newfoundland's freedom, and during the Daniel O'Connell centenary celebration in 1875 alongside flags of other countries. As late as 1884 it was still being flown as the unofficial flag. The same tricolour flag was adopted by two other societies, the Newfoundland Fishermen's Society and the Total Abstinence and Benefit Society, both founded in 1858, which added their own slogans and badges. Since the PWG did not originate either with Bishop Fleming or the NNS, where did it come from? It has been forgotten that pink, white and green are the colours of the Star of the Sea Association (SOS), a mutual benefit society founded in 1871 by the Catholic Church. Its flag consisted of a white star with a pink cross on a green background, and its officers wore sashes with the same colours. Given the Church's involvement, pink was probably selected as a liturgical colour. The Native and SOS flags were sometimes flown together, for example in a 1,500-strong Catholic procession in 1872. Although the formal banner remained in use, the SOS appears thereafter to have simplified its flag to a tricolour, as it is only after the creation of the SOS in 1871 that the PWG appears in the sources. The colours of the SOS are therefore the most likely origin of the PWG flag. The 1880s-90s were, it seems, a transition period. The true Native flag of red, white and green disappears from the sources, to be replaced by a new "native flag" of pink, white and green. In part, this was due to the passage of time. The NNS itself was gone by the mid-1860s, so there was no one to officially carry the flag forward, though it remained in use for years afterwards. Meanwhile the SOS had quickly become the largest society in St. John's, its membership peaking at 2,000. It held events which thousands attended and prominently displayed its colours. It was clerically-supported, patronized by politicians and became deeply engrained in the social fabric of the city. Supported by the SOS's mass membership, the PWG was everywhere and ultimately supplanted the old Native colours in the public mind. Reports of many public events featuring all denominations mention the PWG and described it as the flag of Newfoundland. For example, an 1892 event for Roman Catholic Bishop Michael Howley featured the PWG, which was explicitly described as the Newfoundland tricolour. In 1896 the fire department adopted the PWG as its new banner at a public ceremony. Decorations for Queen Victoria's 1897 Diamond Jubilee were described as being in the native colours of pink, white and green. In 1902 the PWG was bolstered by the creation of two anthems. Sir Cavendish Boyle's Ode to Newfoundland was made the official anthem on 20 May 1904. Its sheet music cover featured the PWG and is now a well-recognized historical image. Bishop Howley's The Flag of Newfoundland eulogized the banner as representing in its colours the island's English, Irish and Scottish ancestors. He clearly intended to overcome any perception of the PWG as a Catholic flag by turning it into a symbol representing all Newfoundlanders, and he appears to have been successful. Finally, as a nationalist symbol the PWG was closely tied to Premier Robert Bond and his finance minister Edward Jackman, himself President of the SOS. This was further reinforced by Bond's 1904 success in resolving the French Shore issue. There are many examples in the press of citizens connecting Bond, the PWG and Newfoundland's future prosperity. 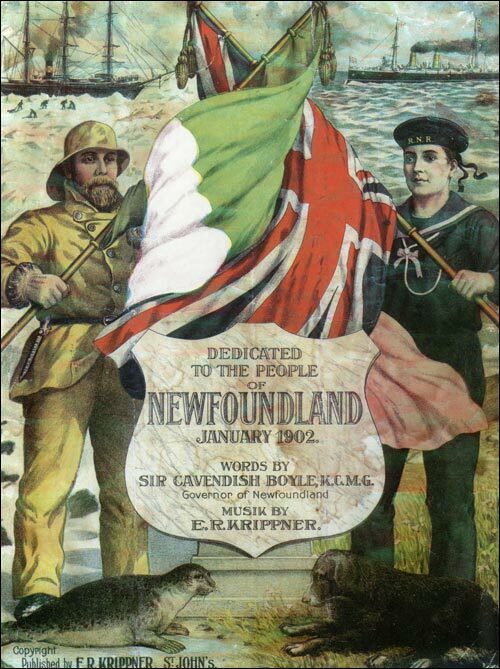 Sir Cavendish Boyle's Ode to Newfoundland was made the official anthem on 20 May 1904. Its sheet music cover featured the PWG and is now a well-recognized historical image. Artist unknown. Image courtesy of Robert Cuff. For other flag related articles view the Society and Culture Table of Contents.